Want a slice of Portugal combined with island life? Try Madeira holidays. There are beautiful beaches, volcanic caves, traditional towns to discover and water sports to get into. Go north to the volcanic salt water pools of Porto Moniz or to Canico for an incredible flat pebble beach or visit the island's capital city of Funchal, which offers plenty of cosy cafes set amidst stunning views. Overall, Madeira offers varied holidays that will suit any budget. In fact there is so much we think you’ll want to visit again and again! Talk to Purple Travel now about cheap holidays to Madeira and save on flights, hotels and transfers. Funchal, Madeira's capital is a charming mix of old and new. Set on a hillside, you've got cobbled streets and traditional restaurants side by side wuth modern malls and a busy marina. There's also a cable car that gives you impressive views of the island. Canico de Baixo is a calm resort, life mainly revolves around the main square and the shops, bars and restuarants that surround it. It's a great resort for walking and scuba diving - nearby Garajau National Marine Park has extremely clear waters. The beaches are surrounded by cliffs, a promendade and some hotels and villas. Just 2km's from the airport, Santa Cruz is a small place where whitewashed churches contrast with the green hills and blue sea. 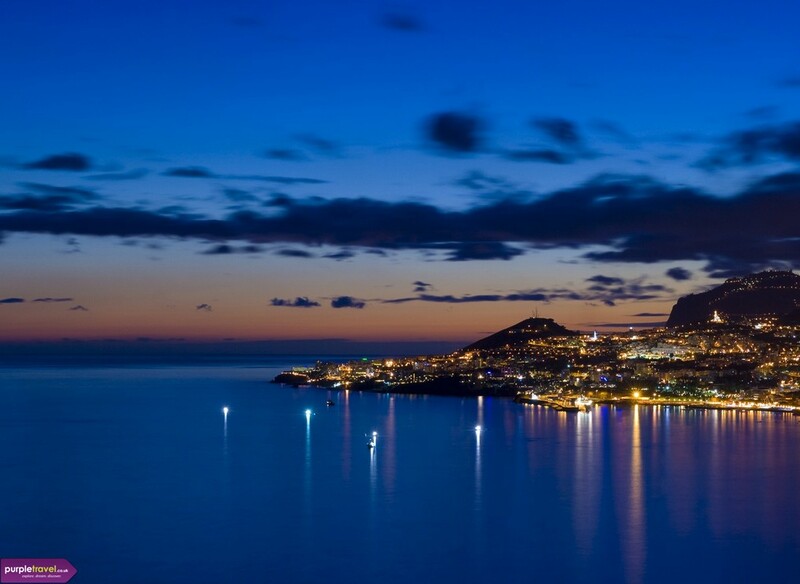 It's a low key place but you won't miss out as Funchal, the island's livlier capital is just 15 minutes away. Explore Madeira by trekking the levadas, used to bring water from the mountains to the fields. They cover an amazing 2000km, taking you through the island's interior. Madeira has a whaling history and still attracts many whale species as well as dolphins and turtles. There are many boat tours you can join whihc will allow you to see them for yourselves. The weather in Madeira is warm but not too hot, you can experience highs of over 30C and lows of under 20C, weather in the winter doesnt drop too much so its still an excellent choice for winter warmth. It won't be a surprise that Funchal's biggest festival involves flowers. You'll see people covered in flowers marching in parades where floats are also covered in flora. Women and children dress in bridesmaid style dresses with flowers in their hair. This is no small-town festival, it's a Rio-style extravaganza held in Funchal and for the while 3 days over carnival you will see dancers sporting elaborate outfits complete with a lot of shimmer and sparkle. The main parade starts near the cable cars and the whole corwd then dances their way along the seafront. The Madeira wine festival is a week-long affair where various villages get involved and show of their finest wines, giving you the chance to sample lots of local wines. Would recommend Funchal as a good place for families or older people. Very good value, we got a great last minute deal. There is lovely scenery and very nice to wander around and have a cup of coffee (or glass of wine!) Local markets are good and some nice options for food too. Weather of course was very sunny. A very friendly place, lovely hotel and great, great food. Scenery is exceptional, it's a glorious island. Very safe and lots to see with museums etc. Funchal is a lovely town, and we thought it was a good base for doing a little exploring in the rest of the island.